Welcome to the heady days of global finance! Money and deals flow like water. From sparse beginnings, build your mercantile empire across the globe. Send agents far and wide to make investments and gain access to valuable resources needed to fulfill lucrative contracts. Struggle for control of regional resources and world markets. As you expand your interests, buy companies that give you an edge on competition and access to venture capital. Since the venture capital market is giving away money, you don't even have to pay it back! Of course, it does tie up valuable agents until you do... You can always use an extra agent on your quest to dominate the world. 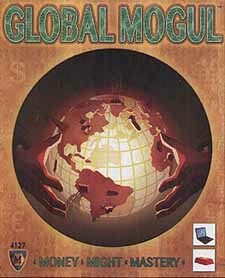 Global Mogul is a limited action, worker placement, resource acquisition, and opportunity management game. Win by being best at balancing your short tern goal of fulfilling contracts for cash with your long term goals of building corporate infrastructure, controlling markets, and regions.